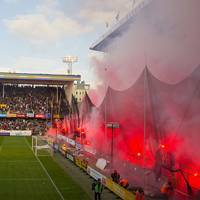 Sweden: Pyrotechnics may soon be legal? Björn Eriksson, Sweden’s coordinator for sports-related violence, is currently running what is called in Sweden as “Hooligan Investigation”. On March 21 he’s supposed to give full report on the findings, which are to be used in legislation changes to make domestic football safer. One of the issues raised is usage pyrotechnic materials. Obviously supporters claim legalizing them would help improve the situation, while police and fire departments emphasize potential risks. But after a meeting with clubs, Swedish FA (SvFF), police, fire and national supporters’ association Eriksson has some ideas. He says there was a change in attitudes on all sides. “Imagine how this works. If you’re planning to bring bengal flares to the north stand of Råsunda, you’re not likely to carry a bucket with sand in one hand and another one with water in the other. But if we allow people to seek permits to light them in specific places, then we can deal with it in a good way”, says Eriksson. According to him, the most striking impression after hearing all sides of this debate is the will to change the situation and not polarize opinions any further. People want a solution for the problem of illegal flares in the stands. Whether it will be legalizing them (and if so, on what conditions), we’ll see within weeks.